It’s giveaway time again! To celebrate the launch of my shop last week, I wanted to host a giveaway to give a reader the chance to win some items, but I’ve been so busy making and adding new stock that I’ve only got round to it now! Sitting Pretty Shop is something I’ve thought about doing for a while. I tried my hand at Vintage selling under the same name, but found it really hard to get it ‘out there’ and find enough time to go sourcing. I’ve always had a love for jewellery, especially vintage and retro style pieces, so I thought I would go down that route instead. At the minute I’m keeping it fairly small and concentrating on promoting it (sorry if I’m spamming up your Twitter feeds!) then once I have got the shop out there I will begin to expand on what I make. I’d love to go into making my own detachable collars a la Marni for H&M, or make dreamcatchers from scratch for the summer. Let me know if either of those would be something you’d be interested in as I’d love to try them out. So, onto the giveaway. The winner will receive two items of their choice from my shop, plus I will throw in one of my handmade ‘Peace’ bracelets on top of that. Sound good? All you need to do to enter is the following. – Be a follower of this blog. This can be via GFC or Bloglovin’, or both! 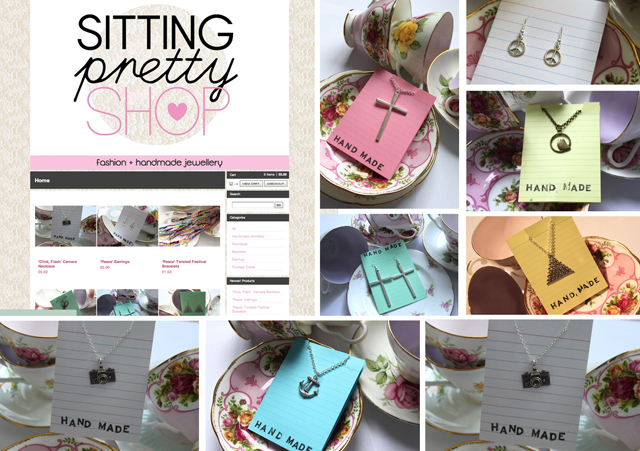 – Go to the Sitting Pretty Shop and choose your two favourite pieces. – Comment on this post saying what you have chosen. – Also leave me your email address or Twitter name as a way of contacting you if you win! So that’s it! Easy peesy! The giveaway will be open for just over a week, and will close on Friday the 16th March at midnight. The winner will be chosen using a random number generator and will be announced shortly after. PS: If you can’t wait, there is a free delivery code ending at midnight tonight! Just enter FREESHIP at checkout. Can I just say, ever since you've posted your shop on twitter I keep going on it admiring all the pretty jewellery! It's a tough one but my favourites are the 'pray' large cross earrings and the crucifix turquoise earrings. Thank you so much for the giveaway! I visited your shop when you first announced that it was open and fell in love with the "Strike" Mini Cross Necklace and the "Strike" Mini Cross earrings. I follow you via GFC as Jessica and my email address is xofeilunhaixo(at)yahoo(dot)com. Ooh you have some lovely things! I think my favourites are the 'Click Flash' camera necklace and the 'Aztec' necklace, hard to choose though! Love the atztec triangle earrings and the Strike' Mini Cross Necklace – but all of your stuff is great! Love the shop! So cute! My favourites are the Scissor necklace and the perched bird necklace, they are just beautiful! My favourites are the festival bracelets and the 'pray' cross earrings! The shop looks great! I absolutely love the Aztec necklace and the mini cross necklace, such awesome pieces. I love them that much, I've even tweeted about it! I'd love to be entered into your generous giveaway please! Your shop's looking great – the two items I've chosen as my favourites are: ''Unlock' Key Necklace' & ''Aztec' Triangle Necklace' – right up my street they are! I adore the 'strike' mini cross necklace and also the aztec triangle necklace. Basically love all of the necklaces as I don't have my ears pierced aha! I like the camera necklace and the kettle necklace! Aww your site is great! J'adore the anchor – so cute!